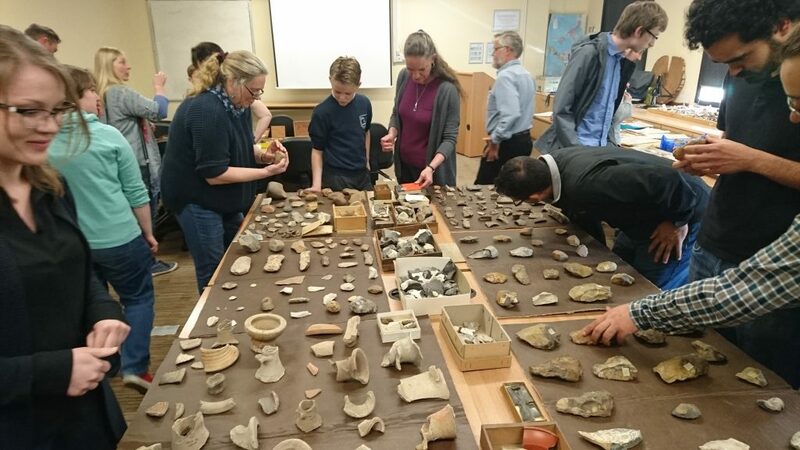 News, stories and goings on from around the Archaeology Department in Exeter. The new academic year is upon us, and we’ve got a brilliant programme of research seminars to deliver for the next two terms! Almost all research seminars will take place on Thursdays, from 2:30-3:30pm, in Laver LT3. All are welcome to attend. Click the link below for the Research Seminar programme! This entry was posted in Around the Department, Research Seminars on 27th Sep, 2017 by Emily Victoria Johnson. It was a full house last week for Dr. Silvia Bello’s presentation on prehistoric cannibalism. She began by defining cannibalism, highlighting the difference between funerary de-fleshing of individuals and evidence of eating flesh, which could possibly look the same in the archaeological record. 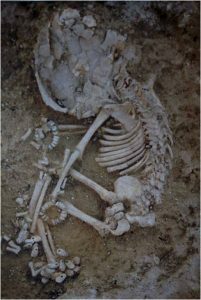 She particularly showed evidence of human gnawing on bones can be instrumental in implying that humans were being eaten. Through analysing the micromorphology of human cutmarks Bello also showed it was potentially possible to differentiate between butchered (cannibalised) bones and bones that were cleaned when not wholly fleshed. She suggested that we separate cannibalism into certain classes, particularly into “necessity” cannibalism and “choice” cannibalism, and gave archaeological and historical examples of each. Finally Bello encouraged us to think not of cannibalism as such a taboo as it is an integral part of cultures around the world. We thank Dr Bello for a fascinating research topic, which this blog does not do justice! You can find out more about her research here. This entry was posted in Around the Department, Research Seminars on 20th Oct, 2016 by Emily Victoria Johnson. 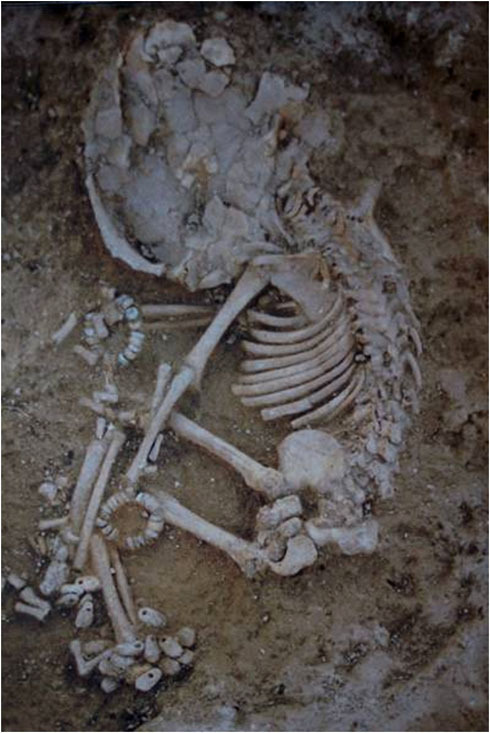 Infant burial from Çatalhöyük. Displayed in the Konya Archaeological Museum. A new addition to the department, the first meeting of the Bioarchaeology Reading Group on the 7th October, was a great success. 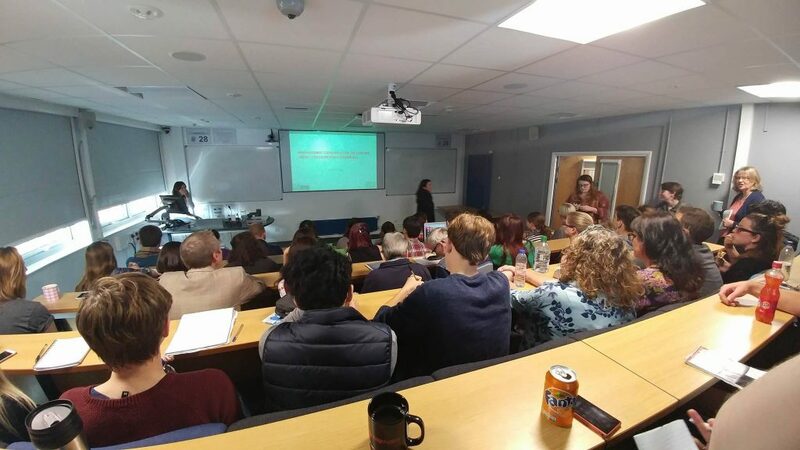 A mix of postgraduate (masters and PhD) students and staff members, fuelled by biscuits, discussed the implications of Gowland’s (2015) paper on bioarchaeology and the life course. It was perhaps interesting to note that this week the reading group’s participants were 90% female, which could have implications for the direction of the discussion as there was focus on maternal health. This entry was posted in Around the Department on 7th Oct, 2016 by Emily Victoria Johnson. 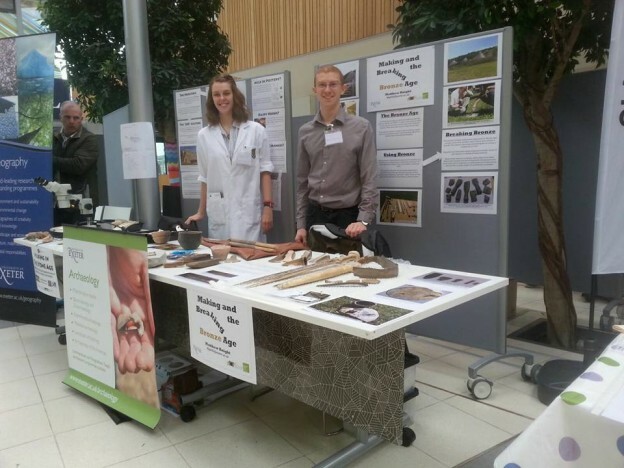 Our first PGtips of the term was our annual Ground-Breaking research showcase! This excellent event has many 5-minute presentations from current PhD researchers on their thesis topics, aimed to introduce new PhD and masters students to the research going on in our department. There was such a good turnout that we ran out of wine! First our PGtips hosts Ethan and Malene welcomed us to a new academic year, explaining that usual sessions have two 20 minute presentations rather than the quick fire overviews students would be seeing today. Presentations began with Emily Johnson speaking about her research on bone fat processing and butchery at the time of the first dairying economies in Neolithic central Europe. Brice Girbal followed with an overview on his near-completed work with crucible steel production in India. Jemma Singleton continued the Indian theme with a description of her work on Neolithic rock art in India. 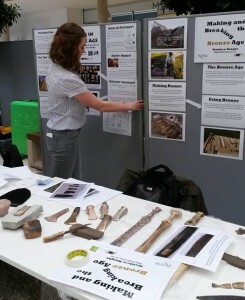 Belinda Tibbetts then spoke about her research on infant and maternal health through analysing skeletal remains. Ethan Greenwood retook the stage to present on the Roman iron industry in the Weald. Elspeth St. John-Brooks, one of our joint AHRC SWW DTP students usually in Reading, showed us some of her work on soil geochemistry. 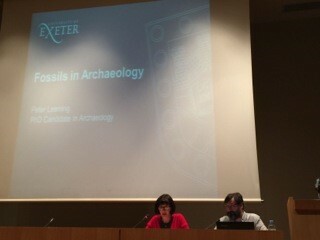 Sabine Martin moved the presentations in the direction of the Palaeolithic with her talk on vein quartz tools. Finally, Alice la Porta presented her research on Neanderthal tool technology, finishing our session by showing us some of her experimental spears and arrows. Many thanks to all of our researchers for kicking off this academic year so well, and thanks to all who attended. PGtips runs roughly every three weeks – if you’re a student at Exeter who is interested in presenting email Malene Lauritsen (mll204@exeter.ac.uk), or follow our facebook group. This entry was posted in Around the Department, Research Seminars on 23rd Sep, 2016 by Emily Victoria Johnson. Next Thursday (22nd September) will be our annual Ground-breaking Research Showcase, where current PhD students will be giving 5 minute presentations on their theses. This is a great chance for new and current students to immerse themselves in the research happening in the department and to meet their colleagues. There will be presentations on zooarchaeology, metallurgy, human osteology, experimental archaeology, and more! The session starts at 16:30 and is expected to run for around an hour. Join us in Laver 218 (second floor, at the front of the building) for research, drinks and baked goods! This entry was posted in Around the Department, Research Seminars on 15th Sep, 2016 by Emily Victoria Johnson. Exeter undergraduates Sophie Pallett and Cristina Crizbasan, recent graduate Jake Godfrey, graduate student Donna Thompson, and Exeter alumnus Emma Rosen are at Ulpia Traiana Sarmizegetusa, the capital of Roman Dacia in Romania participating in a two week archaeological excavation. 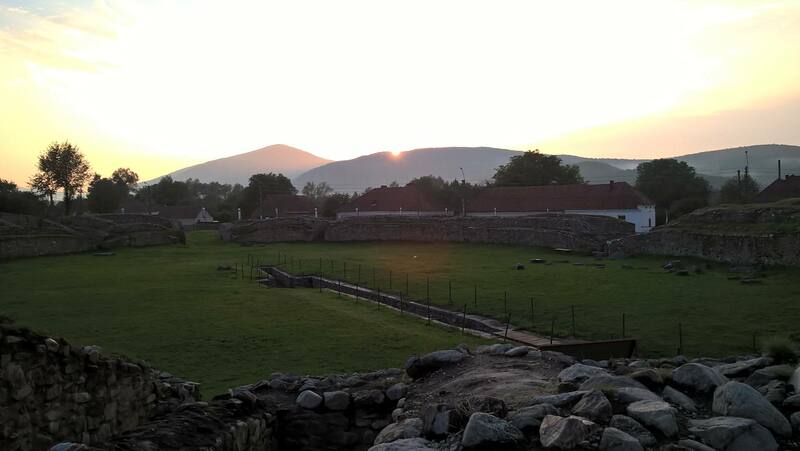 Sarmizegetusa, founded by Roman veterans of the Dacian war early in the second century, once had a population of over 20,000 and boasted an amphitheatre, several temples, and forum. Much of the site – including the forum and coliseum – has been excavated and turned into an archaeological park. This entry was posted in Around the Department, Fieldwork on 11th Aug, 2016 by Emily Victoria Johnson. PhD student Alice La Porta is undertaking archaeological experiments on the nature of Neanderthal spear use this summer as part of her PhD project on Middle Palaeolithic stone tool projectile technology. Read all about her research below! Did Neanderthal use stone-tipped wooden spears as throwing hunting weapons? 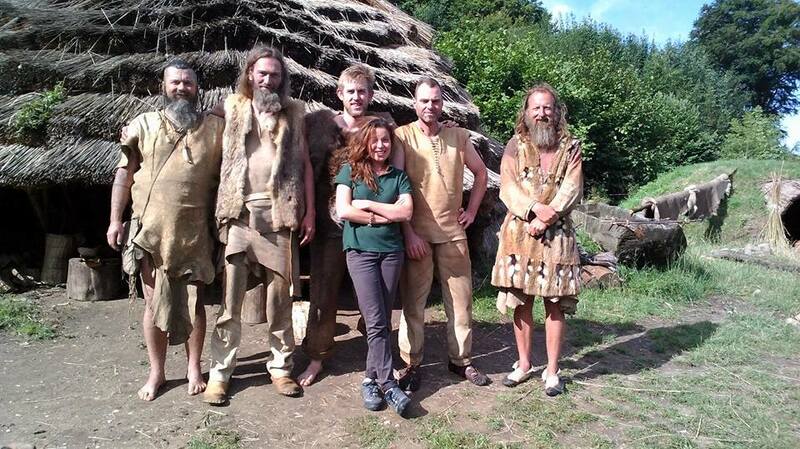 Alice la Porta during the first set of experiments (summer 2015), at Aöza Open-air Museum during the “Mesolithic Living” project. This entry was posted in Around the Department and tagged experimental archaeology, neanderthal, spear on 5th Jul, 2016 by Emily Victoria Johnson. It’s been a quiet couple of months here in the archaeology department, with the Easter holidays putting an end to teaching and the hustle and bustle of undergraduate lectures. 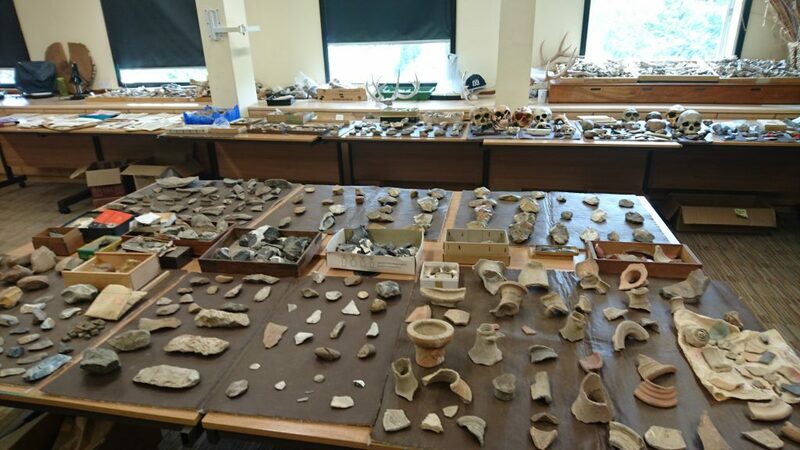 Today, however, the department was busy once more for the official unveiling of the Desmond Collins teaching collection – a collection of bone, lithics, pottery and casts given to the department by the late Desmond Collins. This entry was posted in Around the Department on 18th May, 2016 by Emily Victoria Johnson. Peter Leeming, one of our PhD Candidates in Archaeology, gave a lecture on his research at the Georgia National Museum on Monday 18th April 2016. This entry was posted in Around the Department, Conferences on 19th Apr, 2016 by Emily Victoria Johnson. This entry was posted in Around the Department and tagged archaeology, Community day, community engagement, public on 2nd Apr, 2016 by Emily Victoria Johnson.